Runes are applied to Armor pieces. And most runes do more, the more of the same type of rune you have installed in your armor. 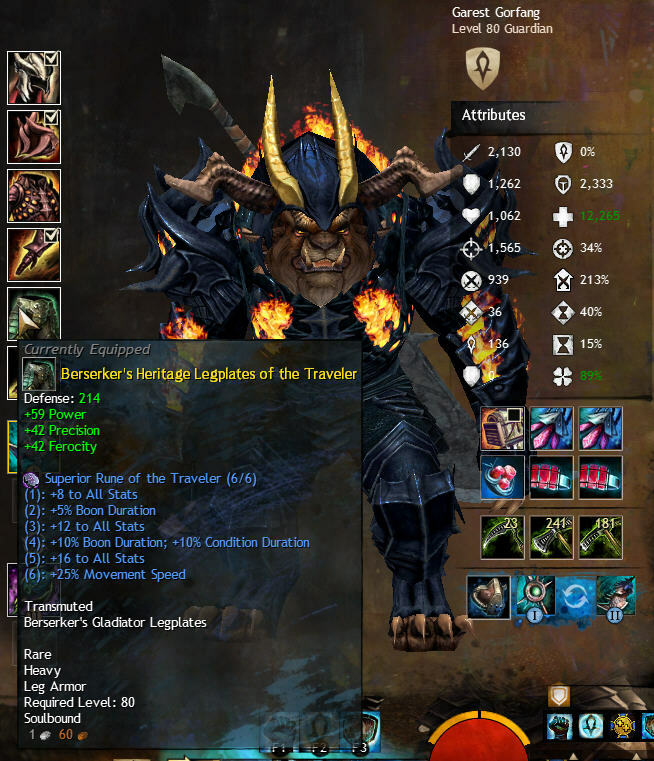 If you have all 6 armor pieces with SRoT then you get the full body of stats listed. You will need to be level 60 to use the runes we are talking about. 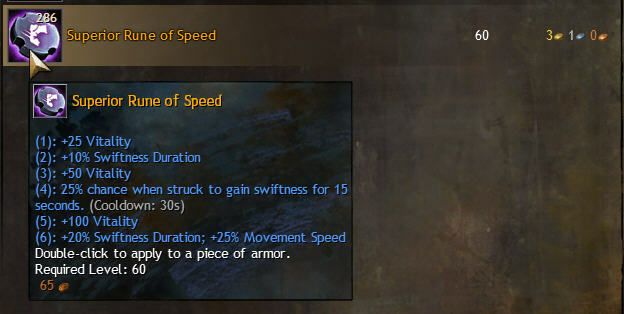 Notice the last line has a +25% movement speed. This may not seem like much, but it’s like riding a mount in this game, since there are no mounts. But this rune costs a bundle. 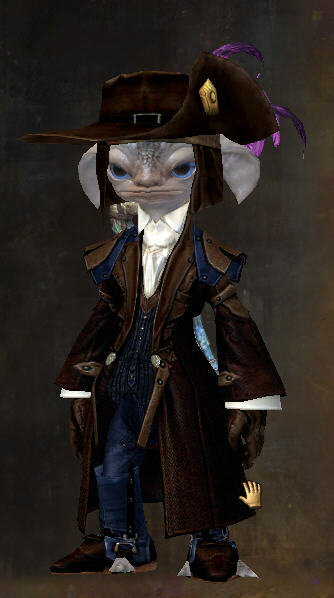 You are going to pay about 8G each for these runes. But if you aren’t that rich, and I no longer am, then you can use the Super Rune of Speed to get the same movement benefit. 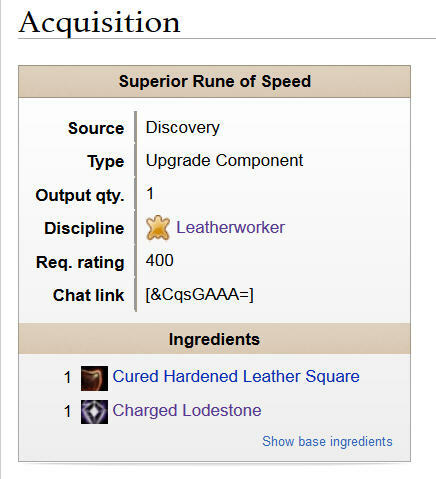 This rune only costs about 3G each on the Trading Post. 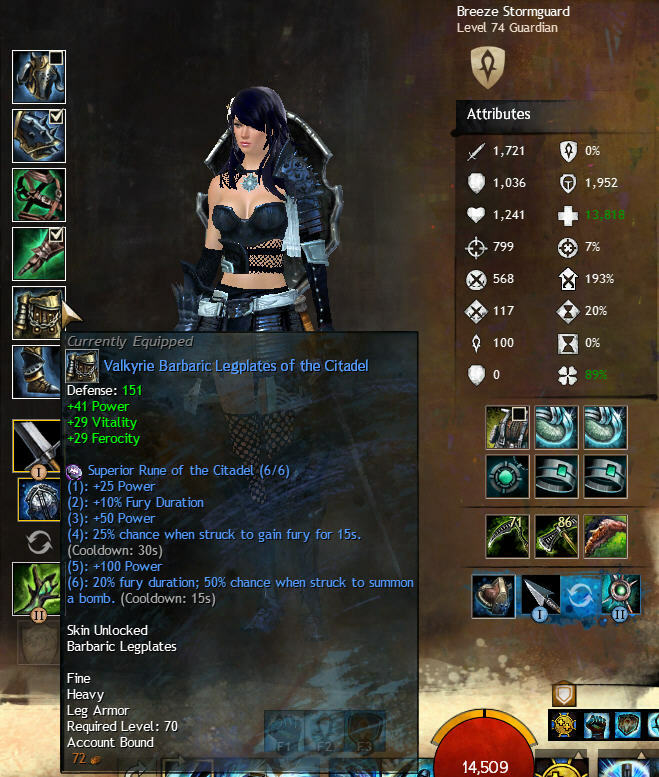 But the Charged Lodestones are going to cost you about 3G so there is not a lot to save unless you can farm these. As a Guardian, before you get your speed runes, you may want to use some other ways to move faster: Keep your staff as a second weapon and drop skill 3 frequently in front of you to run. 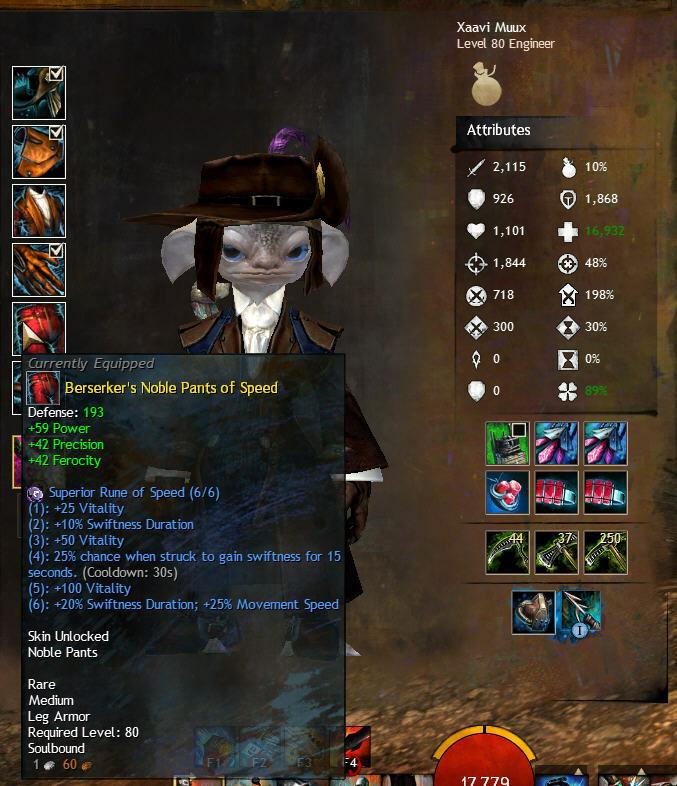 Also there is a Retreat skill, but it has a long cool down and you may not want to tie up a skill slot with that. But there are some other runes that may be useful for Guardians, as well as others, and they are very cheap. Who doesn’t want +100 power? I’m a believer in Power Power Power. I’ve tried the other stats and I believe in Power all the way. The other stats just don’t seem to let me survive as long as having more power to kill the bad guys quicker. Notice the prices in the top right of each picture. I was surprised at how cheap these are. I was ignoring Runes, except for ones I happened upon, until I got to level 80. But with these very powerful and affordable runes, we should use them from level 60 onwards. 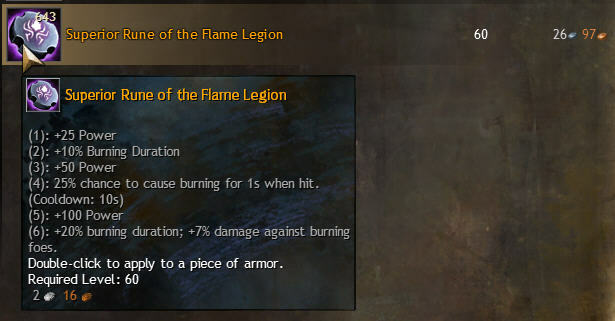 Or for more money there is the Super Rune of the Flame Legion. I don’t see the big benefit unless you are an Elemental who likes Fire Attunement. But 6 of these, or just 5 of these, won’t cost that much. Again you need to be level 60 to use Superior Runes. This should help me get to level 80 in no time. Also, you’ll want to consider this Sigil for your Weapons. You can begin using this pretty early in your career. 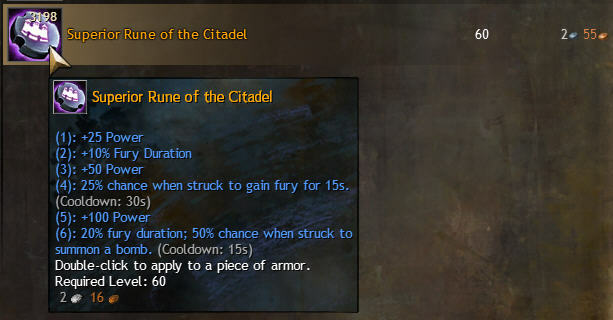 But the important thing to remember is to recover your runes before you salvage your old gear. You don’t want to waste all that money down the drain when you are done with that old gear. So be sure and use this to recover those runes / Sigils if they are costly. 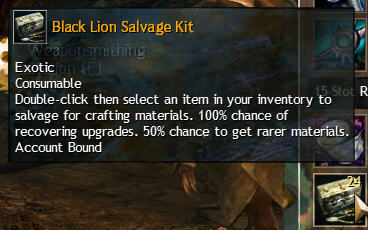 You’ll get a few Black Lion Salvage kits from leveling up or story quests, but you can buy more at the Gem store. They will probably cost less to use than those precious items in your gear.